It’s cold and rainy out today. I’m going to think happy garden thoughts so my feet will warm up. 2014 was a mildly upsetting year up on the roof, though that doesn’t mean I didn’t learn anything! Over the next few weeks I’ll post by general topic instead of a play-by-play. Herbs. Dead rosemary, returning chives, returning thyme. All in all, my “harvest” was much smaller than in years past. 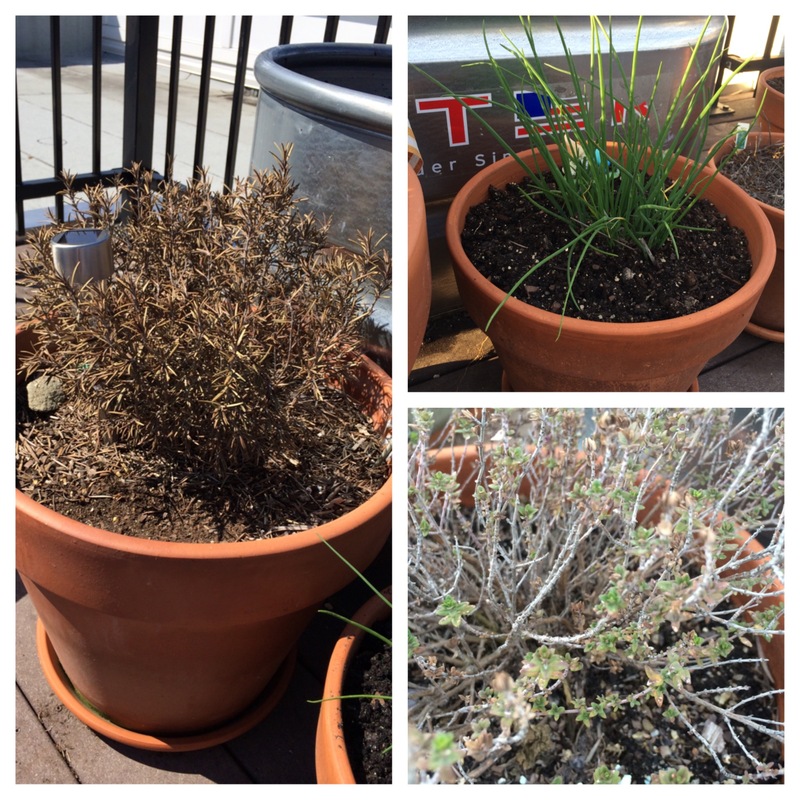 We had some gross cold, cold weather that actually killed my rosemary plant. It had been doing really well over the years, and I had given it a much larger pot. I thought it was pretty hardy. I heard that lots of other folks lost their rosemary. The rest of my herbs came back, though. 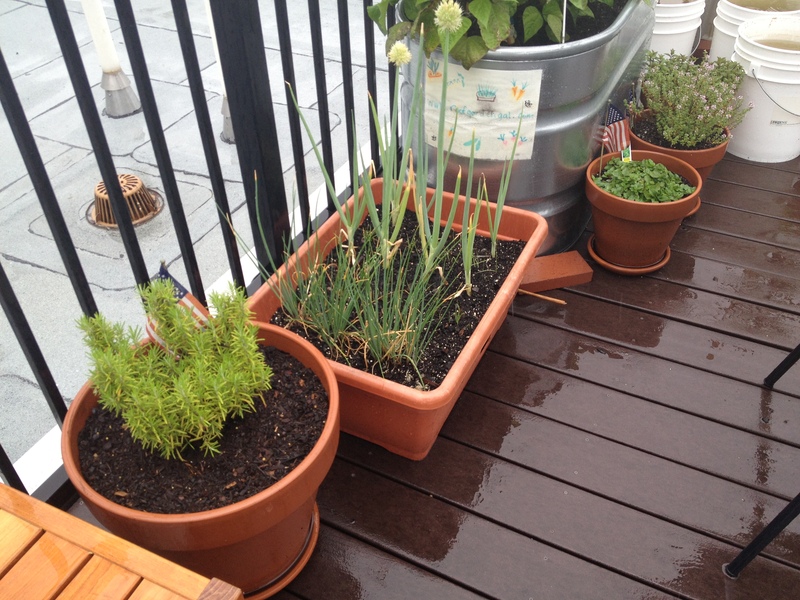 Chives, thyme, and oregano all came back in their pots. I planted new parsley in a pot, and then both green and purple basil in one of the tanks from seed. They wound up doing well. I still have not replaced the rosemary. Debating what to do there, if I should try some indoor herb gardening this year. I brought one plant inside last week but I don’t know if I want to make a whole indoor garden out of it. 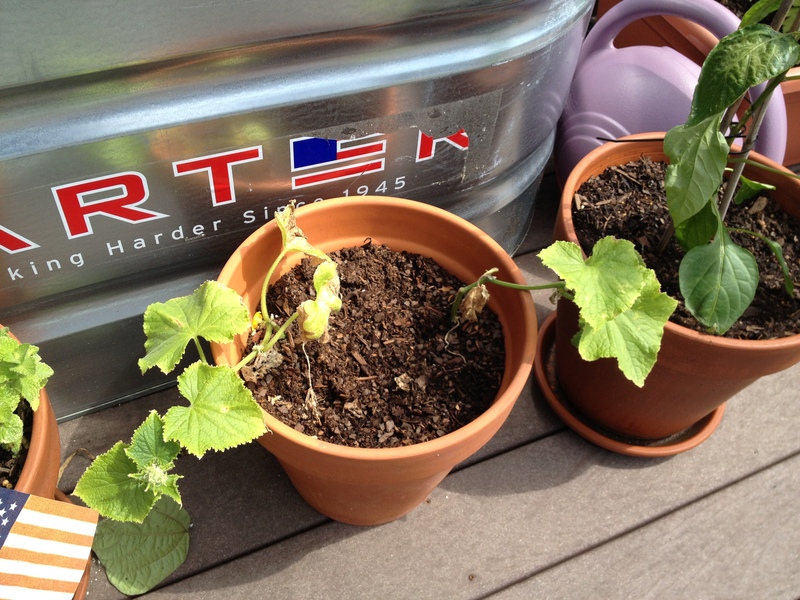 Tank 1, cucumber seed, bean seedling, tank 2. Then we had a bit of a cold snap in May that killed off several seedlings I had started indoors and had replanted outside. I started beans inside. They died, so I wound up planting them a second time. Here are my tanks and some wee baby seeds. The tank on the top wound up with cucumbers, beans, and beets. The one on the bottom had the same as last year, two tomato plants, variety of carrots, and the aforementioned green and purple basils. I planed fewer carrots than last year, and I think they grew much better because of it. I decided to tackle my problems with water this year. I built (what I thought would be) a great rain barrel! You’ll have to wait for my next post for my great 2014 water adventure. The highlight of this year was certainly my composting abilities. I had two buckets that did really well. I’ll save that for another post as well. 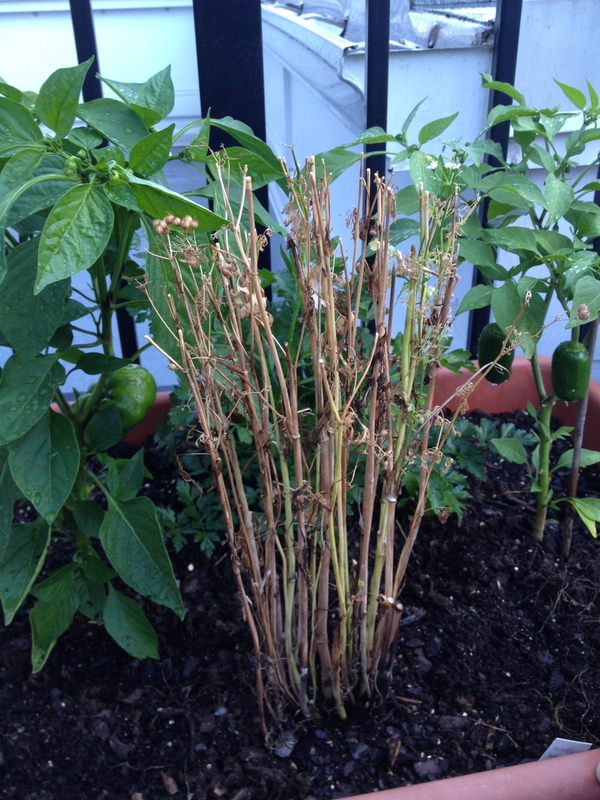 I’ve been a bad blogger…but only because I’ve been a bad gardener. Apologies. I got very busy in August with work and all of a sudden it’s spring. Or, “snow spring” as we had. Before I start up new posts later this week with water news, tank redesign and pot repositioning, some quick highlights from last year. Alton was RIGHT! He exists, and he’s a nasty, aggressive jerk of a Jay bird. I finally caught him on one of my tomato plants in late July. I walked over to him and yelled at him, and he yelled right back at me. Short of covering the whole tank and plants with netting, I didn’t know what to do. (Scarecrow? Maybe I’ll do that this year.) I finally got him off the plant, and he flew onto the top of the elevator lobby on the other side of the roof, still yelling at me. I have no doubt that he came back after that, probably bringing some of his posse to squawk at me just in case. I’ll share in the event that he returns this year. As I mentioned in an earlier post, I adopted several pepper plants from friends’ windowsills and patios. While I won’t be doing that again, I did have quite a harvest of various types of peppers, including bell and several kinds of hot peppers. None of the bell peppers got really big, but they had nice flavor. I used a few of the jalapenos to make spicy simple syrups. One of my neighbors was excited to try the red chilies, so I told her to take as many as she and her husband would like. Later, I heard that the peppers made him sick. As it turns out, they had never cooked with hot peppers before, and in fact, didn’t even realize that they were HOT! Yikes. That’s an eyeball scratch I’d certainly like to avoid. 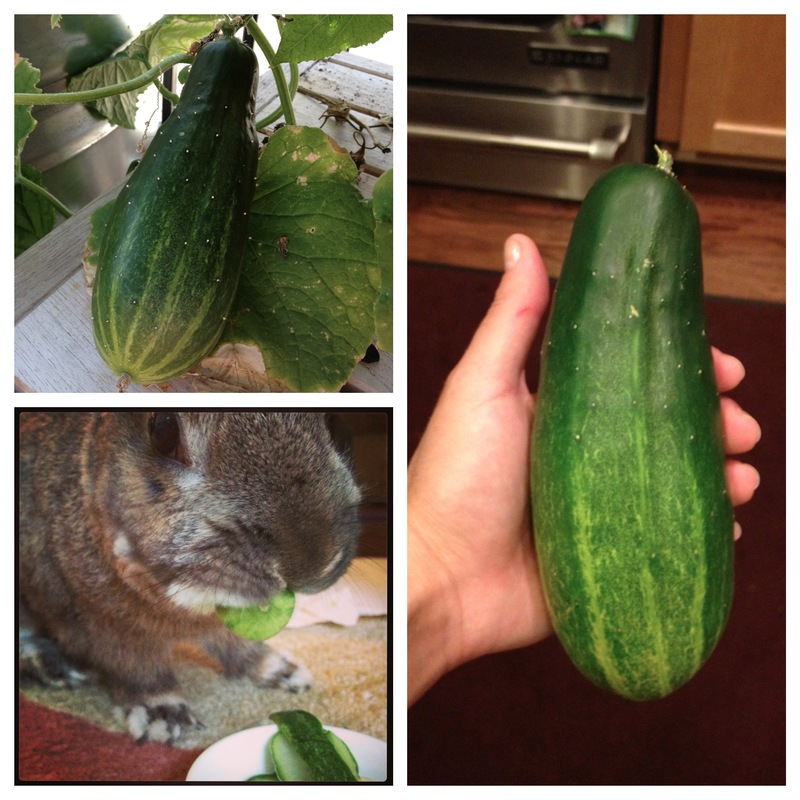 I was very happy with my first successful harvest of cucumbers last year. I’ve talked about the significance of the cucumbers and my grandfather’s never ending desire for pickles in the garden years ago, so this year I will once again plant cucumbers. They need more water than I had been giving them, but I have a new plan for that. I’d like to actually pickle some of them this year as I did with the radishes last year. I need to pick them when they’re a bit smaller than they are in this photo, otherwise they get bitter and have huge seeds. But just in case, I also learned that Dolley is a fan of the bitter cucumber skins. Growing carrots in the tank was so much better than in the small buckets the year prior. They were, for the most part, straight, but not very thick. All in all, however, I’m not totally happy with the volume of the carrot harvest I had last year. I had tried to make seed tape, but I think that didn’t work. Maybe it was using diluted school glue? I’ve seen directions for DIY seed tape that suggest using flour and water as the adhesive, so maybe I shouldn’t have used Elmer’s. Oh well. I’m not going to use it at all this year. I’m going to stick to the Kyoto Reds that Farmer Russell gave me last year (the two long carrots in the photo), as they seemed to do well, and the purple ones. They also did nicely and are very pretty. I also need to thin the carrots MUCH MORE than I did last year. They were too squished for space, and many of them didn’t get much larger than seedling size. When I started to clean out the tanks this year, I encountered many baby sized carrots that never grew. My trusty taste tester didn’t have much feedback this time besides a hefty yank of the sample vegetable. 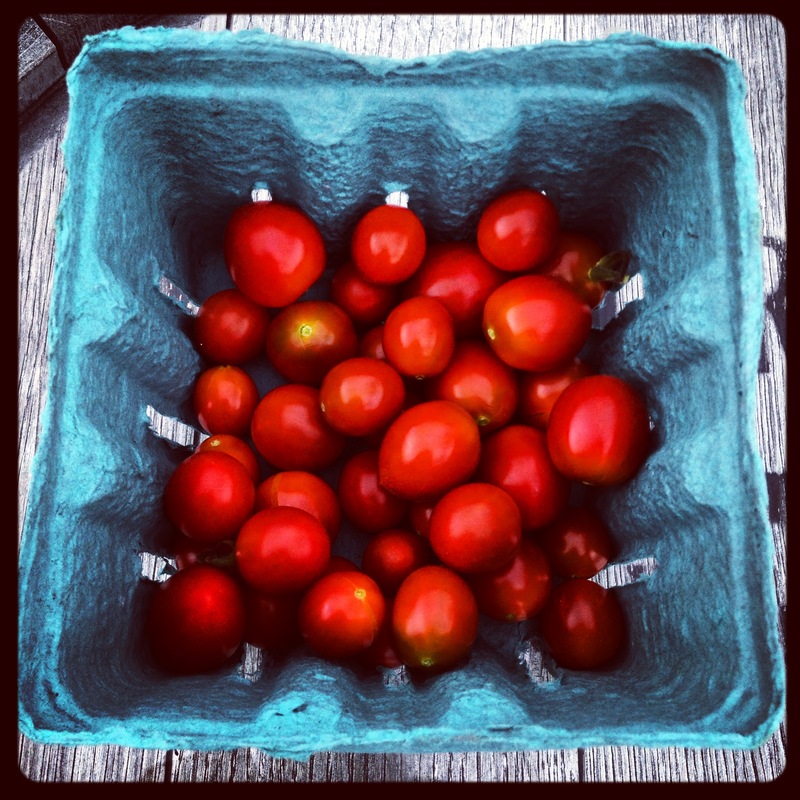 And finally, some lovely cherry tomatoes, unpecked by birds. Well, they’re not pickled just yet. This is last week’s pepper harvest. Banana peppers from ShmErin’s plant, bells from ShmAli’s, red jalapenos from my plant. The plant currently has about a dozen banana peppers ready to pick. I’ll do that tomorrow. The bell peppers are also doing well, but they’re not getting to, like, actual pepper size. The green peppers here are supposed to be red and the red ones are supposed to be green. Some picked too early (they were starting to get soft spots) and some too late. 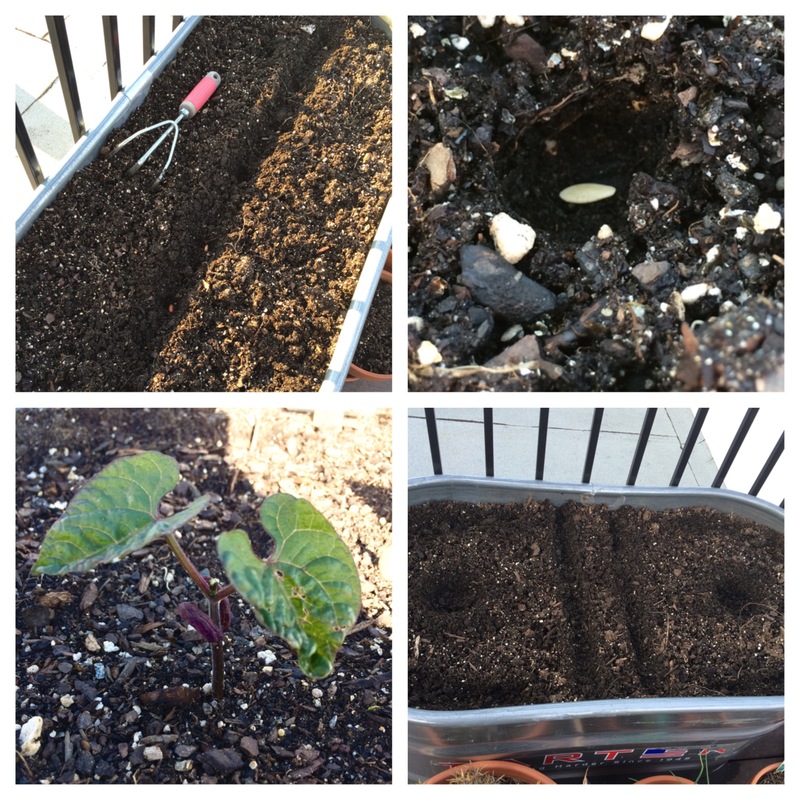 I have actually transplanted three of the plants…more on that in a day or two. 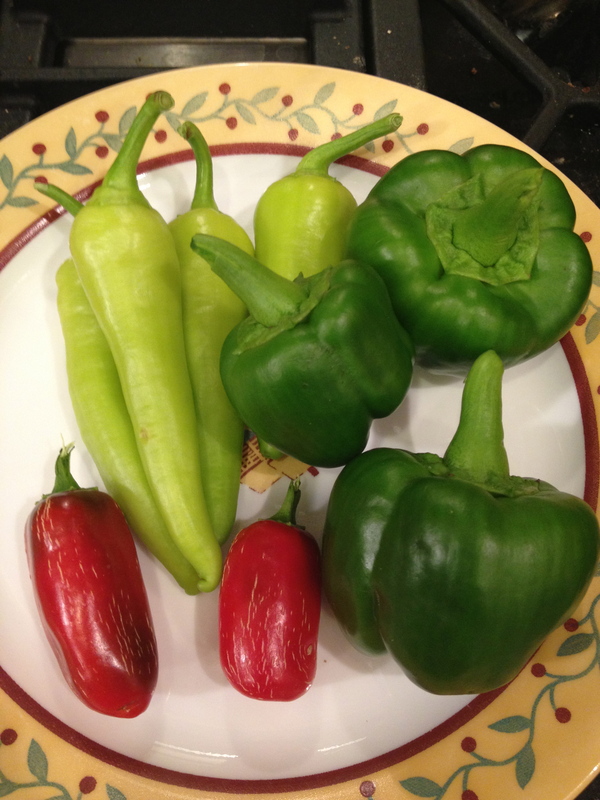 Here are the three plants that these peppers came from. The bell pepper has been getting really thirsty since this heat wave started. I’ve been bringing it water about 2x a day. It generally responds within about 15 minutes by waving “thanks” to me. So about three weeks ago I asked my neighbor if she saw anyone taking my chocolate cherries. Although I’ve offered her tomatoes and herbs as she liked, she has repeatedly refused, saying I should enjoy the fruits of my labor. So, I couldn’t figure out who was stealing my cherries. Then, I noticed one of the other tomatoes on the other plant was half eaten. Then another. Could this be the elusive soft-bellied tomato pecker that Alton Brown and neighbor McGregor talked about in Good Eats episode 6, season 6, “Tomato Envy”? I am a victim of the soft-bellied tomato pecker! Cucumbers were moving along really nicely for several weeks. I decided to pick off the little baby cucumbers once I saw one or two nice sized ones growing on each plant. It really seemed to help them along. Rather than having the plant focus on a dozen babies, I encouraged them to just pay attention to a few. Seemed to work well. I actually picked enough to not know what to do with them at one point. We sliced them up and nommed on them while biking one day. Great snack! I wound up making a cold cucumber soup. Easy and totally delish. Used cuces and onions from the garden. Cold cucumber soup with dill. Lil’ guys who weren’t going to make it. But, all good things must end. After picking a whole bunch of beans one day, I noticed that most of the leaves were starting to yellow and the beans themselves weren’t looking great. The cucumbers in the tanks were also not so hot anymore, probably because it has been so hot. I’ve been bringing each tank a full 5 gallons every day, plus more for the smaller pots, but with almost a week of temps near 100, it just wasn’t working. Sadly, this tank is nearing its end. My compost had been growing weird things…I was advised against nibbling on these mushrooms, as they are toadstools and will kill me. I’ll skip them. I also saw a number of larvae squirming around here and there. So, I got another bucket and divided the compost in half, adding several days of rabbit litter to each one. Today, both bins are doing well, no mushrooms, and no wiggly things. Compost 1 and compost 2. New solar lights. $1 at Target a few weeks ago. FYI…I’m rather enjoying Instagram and Picstitch, as you may have picked up in the last few posts. Last week, we put up lights for our July 4 get together on the rooftop. I was really surprised at how pretty the tanks looked with the lights all around. We also made lots of snacks. Ice cream pops with fruit. RED WHITE & BLUE! We’re really cooking now! Tomatoes, cuces, peppers, beans…almost everything is growing well up on the roof. What’s not? Cilantro. But, remember, I don’t really care, as it tastes like soap. I don’t, however, know why it died. I’m thinking it’s because those bins don’t dry out as well as the terra cotta pots or the tanks. It wasn’t a problem in the past, but I think with all of the rain we’ve gotten in the last few weeks it hasn’t had a chance to dry out, and therefore the cilantro is over watered. The parsley and peppers in the same bin are fine, it seems, but the baby onions in the other bucket seem to be stunted also. Oh well. Win some, lose some. 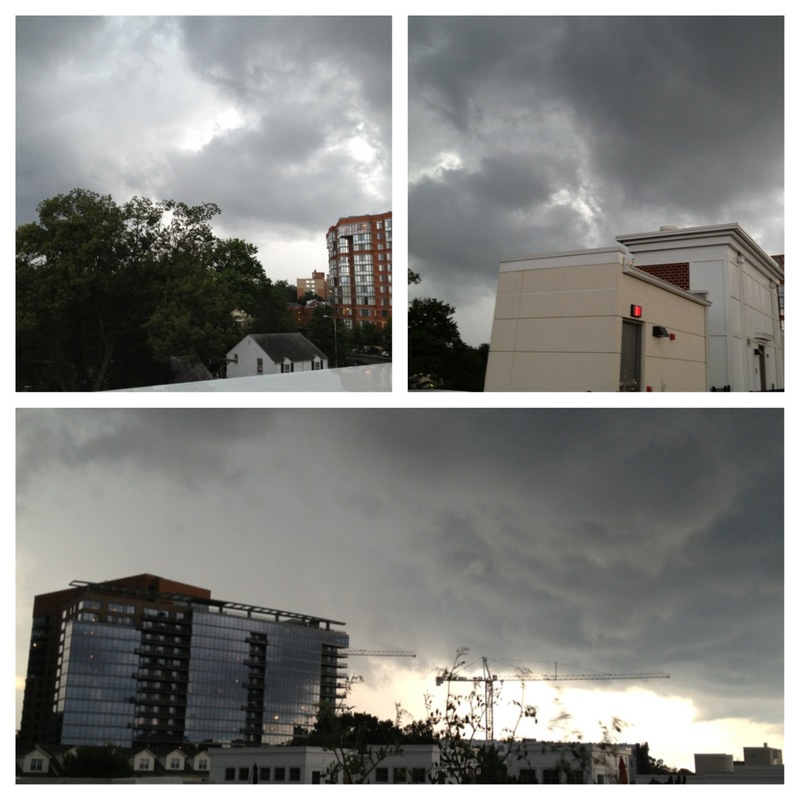 On the left here are some scenes from the most recent strong storm we had. In and out in under 45 minutes, usually. I haven’t even collected water for weeks. Now, on to veggies I actually like. I have become the pepper whisperer. Two friends brought their sad, almost sickly pepper plants up to the roof, and lo and behold, magical healing takes place under my watch. ShmAli brought her yellow bell pepper over maybe three weeks ago. She was keeping it on her kitchen windowsill. Once up outside, it dropped a bunch of sad leaves, and then started to regrow new ones quickly. ShmErin also had two indoor peppers, a banana and some sort of chili pepper. They had grown to about 3′ tall and were kind of lanky. They also had spider mites. Booo. After two weeks on the roof, a ton of banana peppers appeared. ShmAli’s plant after some nice leaf growth. ShmErin’s plants, after being staked. I have since bungee corded them to the fence. Beans I wind up picking every two days or so. The smaller, thinner ones are REALLY sweet. Cuces are doing quite well. The two plants I put in the terra cotta pot and expected to die have been productive and have offered a few final products of their own. I have to pick them before they seed, as the plant’s goal is to reproduce. If you pick them before the seeds inside mature, it will keep making more plants. Same with the beans. The ones that are left on the plant too long get really dry and not tasty at all. Also, smaller seeds taste better and are less fibrous. This one evaded an earlier picking time, apparently. The formerly rejected plant growing well. I’m really looking forward to the tomatoes. They seem to be the crowning achievement of everyone’s home garden, for some reason. Might be the beautiful color contrast. The cabernet grape plant…I don’t think is. These do not have a grape shape. They are more like large cherries, but I’m excited to see how they’re going to do anyway. I think I’ll be ready to pick a few of them this coming weekend. And, for good measure, some of my babies, via Instagram. Hard to see now, but there are 6 cuces hanging over the bin. 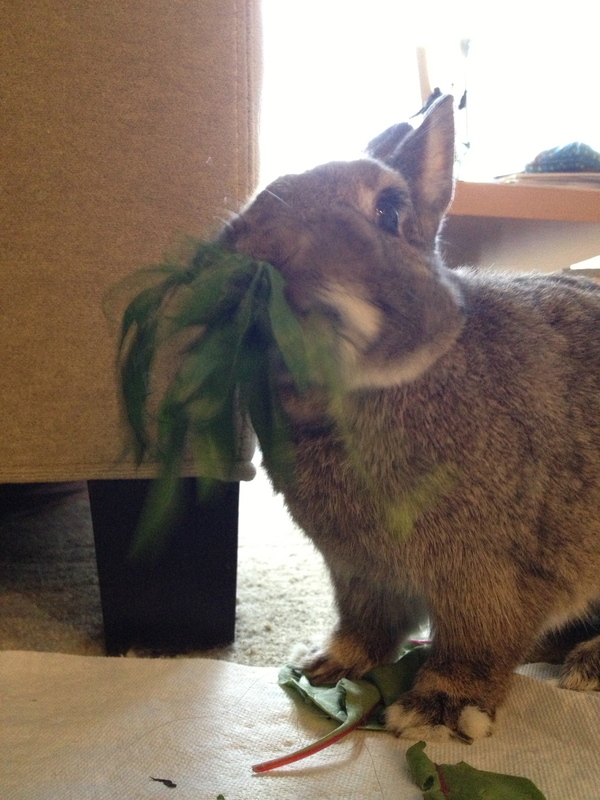 As always, I had a willing parsley taste tester.